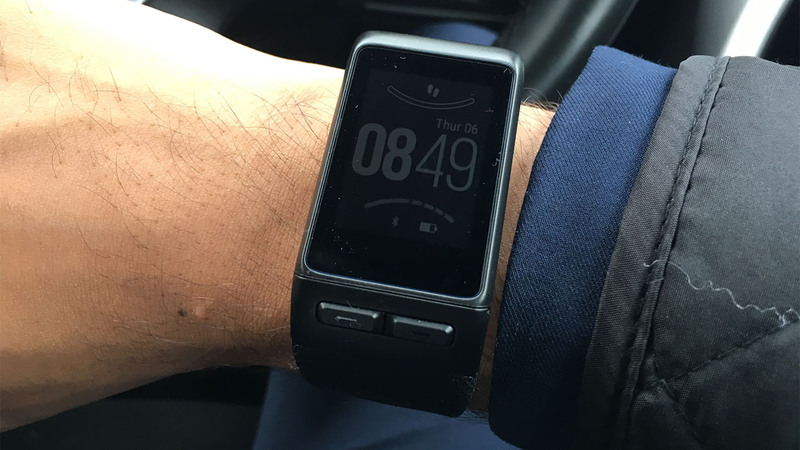 I’ve spent about two weeks with the Garmin Vivoactive HR and I think that is enough time to give it a spin and write about how it suits my needs. In short, I’m disappointed but there are some signs of promise from the Swiss-American company. At the time of reviewing the Garmin Vivoactive HR costs £209.99 from the Garmin website. Thanks to a health-insurance discount I managed to pick up one for £125, but even at that price I would hesitate to recommend it. 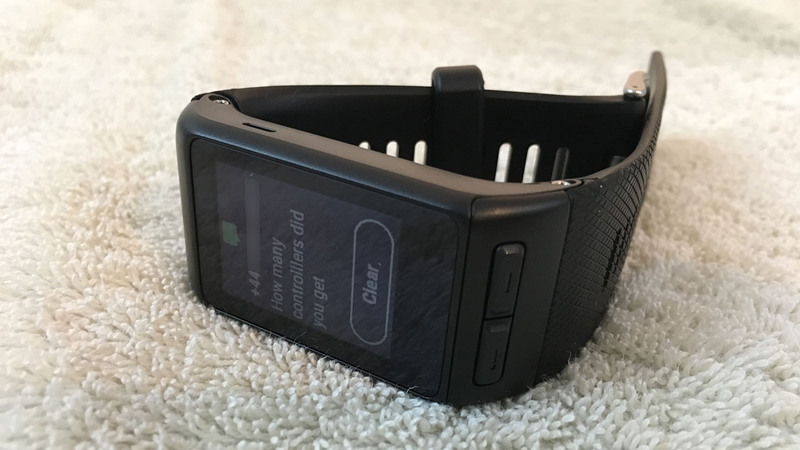 Now my review is not negative (although I may have started it off like that), it’s more of an honest account of how the Garmin Vivoactive HR has worked out for me as a real consumer, not a tech reviewer. I’m going to assume that you’ve read a couple of reviews prior to this and will probably read some more. That means I won’t get bogged down with the specifics like dimensions and analysing accuracy – and instead give an honest account of the main features that attracted me to this product. This review has got more of a negative taste to it because I’m disappointed that a £209.99 product can have so many elementary flaws. The design is okay. I mean, the strap is a lot wider than it looks in pictures. The strap of the Garmin Vivoactive HR is not discrete at all, nor is the watch. It’s hardly flat, but with a built in HRM you can’t really expect it to be. It has two buttons which annoy me a lot. The touchscreen works great, but the two hard buttons aren’t well thought out. They look and feel cheap and ruin the design of the watch. In addition, neither of the buttons act like a ‘Home’ button as found on the iPhone. If you find yourself six menus deep in the watches’ interface, then you have to press the left button six times to get back to the main screen. The button on the right acts as a ‘Menu’ button and to start/stop clocks and activities. The rubber strap seems good so far, but I can only imagine that the cheap plastic of the watch shell will begin to stain and show its lack of quality once the watch has been taken in to the shower regularly (yes it is waterproof). And finally, from the promotional content I saw online, the watch face seemed to rock an (almost) edge-to-edge display that was bright and engaging. Nope. The border is a very obvious margin around 5mm all around. Again, it makes the watch look much cheaper than it is, a lot like the Chinese-manufactured generic smartwatches and fitness trackers available on the internet. It’s responsive. Other reviews complain about the low-resolution and only 16bit colour, but I think it suffices for a fitness watch. It’s not for watching HD movies or sharing 12MP photos – the touchscreen only needs to work when swiped and show information clearly in all conditions. It hardly ever fails to respond to my taps and swipes so it has my approval. During the day, there isn’t much need for the backlight. The low-res display technology used on the Garmin Vivoactive HR sports 16 colours which are all legible in daylight. There is a backlight, though, which is pretty weak. Unless you are in a dark environment (or the shadow of a large tree) you will not notice the backlight at all. The backlight can be configured to work automatically too. That is, when you raise your arm to look at the watch it turns on to make viewing the information on your screen easier. If only it was that simple! I recently reviewed a sub-£30 fitness band that nailed the auto backlight feature. It probably used less complex architecture to just turn on the backlight when there was some degree of motion. For that reason, I could naturally peer at the band, look at the time whilst in bed, whilst driving or when in an unusual position – and it would light up! The Garmin Vivoactive HR isn’t so good at this. When I first received mine on firmware version v2.70 the auto backlight feature didn’t really work at all. After reading forums online I decided to update the firmware to v2.90 (the latest at the time of this review) and there was some improvement. But the £30 fitness band mentioned above did a much better job than this £209.99 smart-watch. The delay between bring the watch up to look at the time and the backlight turning on is irritating. It’s probably only half a second or so but it is enough to make a noticeable displeasurement when quickly glancing at the time. Sometimes, the backlight doesn’t even work unless I make a very exaggerated gesture of looking at my wrist. The firmware (or shall I say Operating System) of the Garmin Vivoactive HR sits between a glorified fitness band and a smart-watch. But, it doesn’t have the simplicity of a fitness band or the full array of advanced features from a smart-watch. At it’s price of £209.99 you would have expected a better attempt at blending the simplicity of a fitness band and features of a smart-watch to create the ultimate fitness tracker. That being said, the downer isn’t the lack of features – oh no, it’s just how painful it can be to access those features and different areas of the watch. To access ‘widgets’ you may have to scroll through seven screens, and then to get back to viewing the time you have to press a physical button several times. This isn’t alleviated by the fact that the timeout duration (time after which it automatically goes back to the home screen) is a minimum of thirty seconds – not ten or fifteen. Another example of the irritating interface is starting an activity. There are so many options (running outdoors, running indoors, rowing outdoors, rowing indoors, walking outdoors, walking indoors, skiing and more) that you may find yourself scrolling unnecessarily to find and start an activity. Then, whilst the activity is running, the Garmin Vivoactive HR defaults to the activity screen rather than the home screen. For some this is good as you can focus on only information regarding your activity, but there is no reference to the time here. So if you were out on a run and wanted to check the time, you would have to swipe (maybe) several times on the face of your watch to get anywhere. However, the existence of the firmware suggests there are likely to be updates in the future which can potentially solve a lot of these problems. 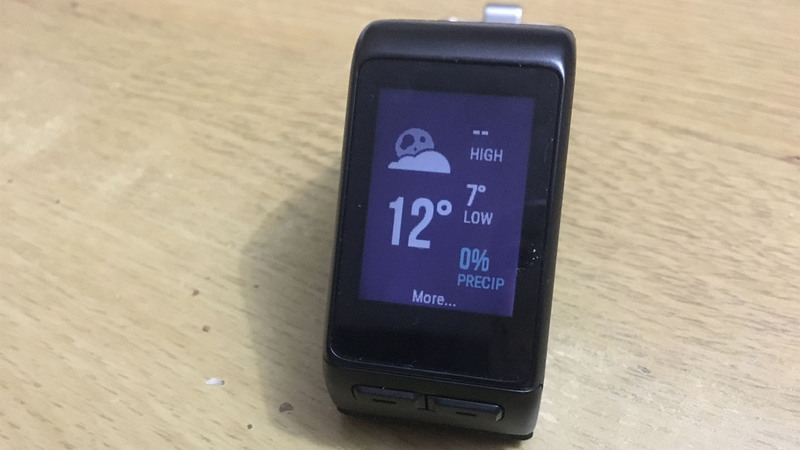 Given that Garmin have reached firmware v2.9 in less than a year, and in the process have made some key improvements, the future of the Garmin Vivoactive HR does look quite promising. In addition, despite the poor layout schema, the responsive touch screen does not add to the irritation of the device. Though I am not completely impressed, and feel that the Apple Watch would have beaten the interface hands-down, I certainly feel like there is a lot of scope for improvement. Well, it isn’t counting the 3000 words in this post as 30,000 steps, so that’s one big step forward from other fitness trackers. As a daily driver it’s very good. Ignore the fact that it is bulkier than the more popular options on the market, it’s very accurate for daily fitness tracking. The fact that it can track metrics for a multitude of activities makes it the go-to fitness tracker for those who have an active lifestyle. In addition, it’s smartwatch features are a treat. I like the fact that the e-ink display can be read really easily during the day. Glancing at the time feels natural, and I get a quick overview of how active I have been. It regularly measures my heart rate through the day and matches it against my activity levels. Later, I can check this through the Garmin Connect app and see how my heart-rate responded to different activities throughout the day. I spend most of my day sitting in front of a computer screen, so the gentle vibrations telling me to get up and move (or at least take a break) are a welcomed feature in aiding me to always hit my activity targets. The smartwatch notifications also generally work well, despite some flaws I highlight in the Smartphone Notifications section of this post. The band has held out pretty well over the last two weeks, but re-adjusting and taking the watch off is a bit more of a hassle than I would like it to be. I usually adjust the watch several times a day: loose during sleep, slightly tighter during the day, and tight enough for accurate heart-rate measurements during workouts. Garmin should consider an all-new proprietary way of improving the wrist-stab as Apple did with MagSafe chargers. Hidden away in the depths of the software that runs on the Garmin Vivoactive HR is the option to add a bunch of gym-related custom activities. One of these is Strength. This custom activity couples really well with Indoor Running and Indoor Rowing to track a gym workout. But like all activities on the Garmin Vivoactive HR, you have to start it manually or it will be logged as a MoveIQ activity. I briefly explain my dislike of MoveIQ in the MoveIQ section. I found myself forgetting to start or stop an activity which meant the Garmin logged my workouts inaccurately. For example, my thirty-minute cardio session became almost an hour long after i forgot to stop recording and went in to the shower. As a result, my average pace was well off the mark! Though I haven’t tried configuring anything, there does seem to be an option on the Garmin Connect Web App to build a custom workout. This gives you prompts on when you need to work harder, take a break or move on. I assume it would be possible to create a custom gym work out which only needs to be initiated at the beginning of a session. Never-the-less, the Garmin Vivoactive HR isn’t really smart enough to figure out when you’ve started and stopped doing a particular activity. But if you can remember to start and stop the timer, the metrics and statistics collected can be very insightful! The Garmin Vivoactive HR is much better than anything else I have ever used for running. MoveIQ sometimes picks up my runs automatically (but also logs them as walks) and records them. But the safest way is to manually initiate the activity. That way you get full GPS tracking of your run with metrics including average pace, fastest speed, slowest speed and lots more – all with a well-constructed graphical illustration of how your heart-rate fared throughout the run. Generally speaking, the GPS is fairly accurate. It gets the distance correct and the route on a map looks about right too. Sometimes, it does cut some corners which suggests that it records GPS co-ordinates at intervals. The best thing is that it makes an ultimate running companion without the need of your smartphone. Everything is logged in the watch, by the watch. And when you get back to your base and sync with your phone, all the information is readily accessible through the Garmin Connect Smartphone app or Web Portal. There’s a bunch of built-in apps available, and even more available through the Garmin Connect store. After my short time with the Garmin Vivoactive HR, I still find it difficult to distinguish between apps and widgets, but what I do know is that they must be downloaded and installed via the Smartphone App or the Garmin Connect Web Portal. There’s a good variety of official apps and widgets (as well as custom clock faces) along with 3rd-party solutions too. The developer community for apps and widgets isn’t huge, but upon browsing I saw 17 pages of downloadable features compatible with the Garmin Vivoactive HR. The are other built-in apps too which I would expect on a fitness tracker including indoor and outdoor running, walking, rowing, swimming and more. As highlighted in the Interface section of this post, I am not keen on how these apps have to be accessed. The Heart-rate Monitor (HRM) used in the Garmin Vivoactive HR is the same sensor used across all current Garmin products, including the premium range of hybrid watches/trackers. I do not have the tools to conduct a test on how accurate the sensor is, but others on the internet have. Generally speaking, the Garmin Vivoactive HR performs well for general HRM, however it falls a little behind versus professional tools when conducting interval training. I found the Garmin Vivoactive HR pretty good with tracking my heart-rate though I had no scientific way of testing the accuracy. There were no wild measurements of 300bpm nor anything lower than 52bpm. In addition, the lower heart-rate readings fell in line with my sleeping patterns and the higher rates seemed right too. For example, there was a short spike on Thursday approx 09:15am as I claimed four flights of stairs to my office. Given that it measures and records the heart-rate throughout the day, whilst boasting a 7-day battery life is pretty impressive and forgiving of it’s small inaccuracies. Finally, many would ask how tight the Garmin Vivoactive HR needs to be worn in order for the HRM to function properly. I never wear wrist accessories so the idea of something tight really puts be off. I have been wearing the watch semi-snug with enough room to push an index finger between my arm and the band – and it still seems okay with tracking my heart-rate. Like every fitness tracker these days, the Garmin Vivoactive HR does track sleep. You need to get in to the settings and tell it your usual sleeping times so it doesn’t accidentally count an 8pm TV session as you sleeping for the night! It does a good job, and hooks up the information to Apple Health iOS 10 as ‘time in bed’. The only massive disadvantage is that it seems to put itself in to do not disturb mode when sleeping, without the option of disabling this feature. That means any urgent notifications will not vibrate on my wrist – nor can I raise my wrist to see the time. It almost defeats the entire purpose of leaving the bulky watch on my wrist whilst sleeping. I would prefer no additional apps as simplicity is key. However, with my short experience with fitness trackers I have learnt than an app is required to sync the data with Apple Health, too. The Garmin Connect smartphone app is very good. Perhaps too good. It can be guilty of trying to show too much information but it is all laid out really well. And after an hour or so playing with the app it all begins to make sense. Asides from the Garmin MoveIQ inaccuracies, it displays information about your day, week, workouts and activity very well. In my opinion, it is much better than the stock Apple Health app shipped in iOS 10. The smartphone app contains a section where you can access all the Vivoactive HR settings and more. You can use the app to add and remove Apps & Widgets, adjust various other settings and force a manual sync to update data. The same Garmin Connect app can be used with all of Garmin’s other fitness trackers and devices, so if you have upgraded to the Vivoactive HR there is no need to worry about migrating past fitness data. There is some well-defined integration with Apple Health. The Garmin Connect companion app (which must be installed to use the Garmin Vivoactive HR) can access Apple Health values including Active Energy, Body Fat Percentage, Flights Climbed, Heart Rate, Resting Energy, Sleep Analysis, Steps, Walking + Running Distance, Weight, Workouts and Height. That means that data from your wristband can be synced to your Apple Health profile and therefore on to other apps too! I have found that Apple Health doesn’t respond too well to external inputs for things like steps. It seems to prefer giving itself a higher priority. For example, my Garmin Vivoactive HR recorded 14,000 steps and 8 flights of stairs climbed. The Apple Health app (even a day after syncing) only shows 9,000 steps and 8 flights of stairs climbed. This suggests to me that the extra 5,000 steps I did wearing the Garmin playing football at lunch are excluded from the Apple Health app. Weird. I’m not sure who to blame: Apple or Garmin? The Garmin Connect Web App is so sophisticated, it deserves an entire review article. 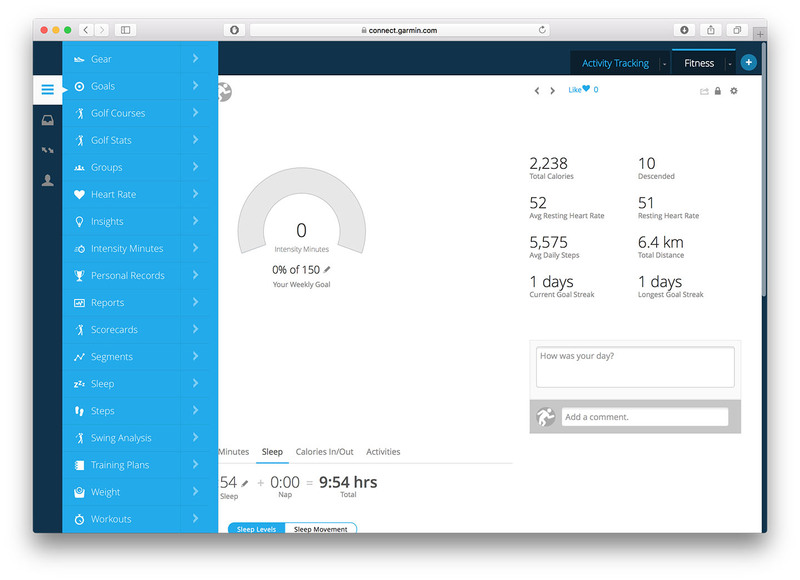 There is far too much for me to poke around in, and review – but safe to say it is a very good way at collecting, viewing, modifying and analysing your fitness statistics. It really does have just about everything, and it connects to all your Garmin fitness devices too. My only real complaint of the Garmin Connect Web App is based around the pitfalls of MoveIQ. I’ve outlined them in the MoveIQ section, so no need to rant twice! MoveIQ is marketin jargon to make the Garmin Vivoactive HR have more features than it actually does. For the very basic, first-time user it may be great but you will soon grow sick of it’s incomplete features. MoveIQ is supposed to be able to automatically recognise when you participate in an activity based on your movements and rhythm. But, Garmin have seemed to have shipped this feature without completing it. If you forget to tell the watch you are about to go for a run, MoveIQ will automatically pick up that you’re running and add it to your daily timeline for activities. But you will not be able to access it like manually initiated activities. Instead, it adds only to the number of steps you have taken, calories burnt and distance covered. If an activity is manually initiated, you are able to view it later in your list of activities. You will be able to analyse your pace, heart-rate, intensity, maximum speed, average speed minute-by-minute. With MoveIQ, you will be left frustrated that you forgot to start the timer, and may have to leave a 30min football session as a MoveIQ identified ‘walking’ session. That means you cannot review your performance whilst playing your sport, including the most basics like distance covered! It’s a great feature that almost every fitness tracker has now, but it has been left unrefined. At the very least, Garmin need to allow users to modify the type of activity later on in case MoveIQ mistakenly identifies a high-intensity 5-a-side football game as walking. 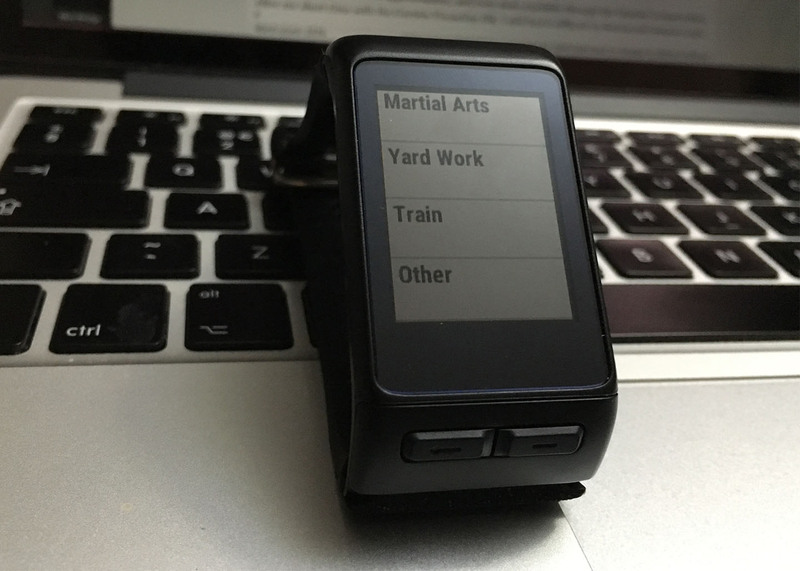 The Garmin Vivoactive HR is great at pulling notifications from your Smartphone and displaying them on-screen. The relatively larger screen allows you to view a lot more of the message too. But expect longer messages to be cut off. It’s enough to determine whether the message is important and requires immediate attention. There is also support for some basic emojis too. However, what I dislike about the smartphone notifications relays back to the Interface section. Until you open and read each message or press ‘Clear’ when it first displays it will create a list of all notifications. It’s a bit of a pain to keep that particular widget screen clear from old messages that might even be several hours or days old. Still, it is possible to adjust the settings so that not all notifications come through. For example you can limit the notifications to only social media and private messaging and therefore ignore notifications from emails and entertainment apps like YouTube. On an iPhone, clearing the Notification banner will also clear the notification list on the Garmin Vivoactive HR. Before purchasing the Garmin Vivoactive HR I was very sceptical about the readability of the screen. I bought the product as a fitness tracker with added benefits, so if it was a pain to glance at the screen and read data during the day it would not go down in my books. Despite having a low-resolution display with only 16 colours, it is very readable in daylight. I have spoken about the backlight separately in this post, but generally speaking, during the day where a backlight is not needed the high-contrast screen is simple and easy to read. Most icons and text have a crisp sans-serif typeface which helps too. One of the reasons I went for the Garmin Vivoactive HR instead of the Vivosmart HR+ was the advertised battery life. Garmin claim that this watch can get around seven days of general usage, and 13 hours of GPS-enabled tracking. That’s pretty decent: a week of normal use, or 13 hours of tracking your running. I personally run about five hours a week, so there is enough room in those guidelines figures for my needs. When I received my Garmin, it was on 72%. I didn’t bother charging it, instead I began using it right away. It lasted me a full seven days with very limited GPS usage, and the battery had only drained to 13%. That means I probably could have squeezed out another 24-36 hours before it died. What impressed me even more though, is that I plugged it in to my Apple MacBook Pro (USB 3) and it had charged to 97% in around ninety minutes! That is impressive… And very convenient too! Instead of worrying about charging it overnight, I can take it off in the morning, leave it to charge whilst I shower and get dressed – and by the time I am ready to leave for work it will be more-or-less fully charged. Nice! There is a slight hiccup though. It continues trying to measure my heart-rate. Reading a zero doesn’t put the device in to a frenzy that I have died, but it does bring down the average which will distort my overview statistics. I hope Garmin can introduce a firmware update in the future that stops it from measuring heart-rate so regularly if it reports 0bpm. The Garmin Connect is by far the best fitness tracking wearable I have used, but at £209.99 RRP it is expensive for an unrefined product. If Garmin manage to iron out the creases in the next 8-12 months, then it certainly is a killer smartwatch/fitness tracker. Most of the issues can be fixed with firmware updates, unless the limited internal memory is insufficient for major improvements. I like the fact that it supports a multitude of activities so well. It’s integration with the Apple Health ecosystem and its own Garmin Connect App really do make it painless to use. However, the onboard interface needs some work to match the Garmin Connect app’s user experience levels.